From the picture it looks like he bought a Dodge. That`s why his wife she was so mad. 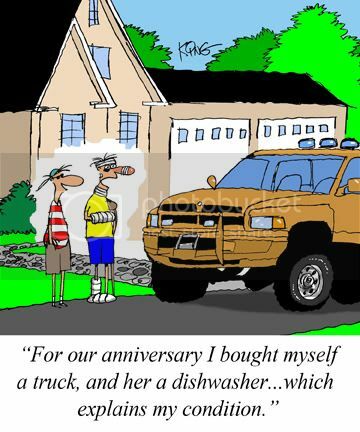 If he bought a Chevy, she would have been happy about it. If my spouse brought home a dodge she`d look like that too! That`s funny. It does look like a Dodge. I`ll see if we can`t get some cartoons more Chevy-centric! Please promote "EON Cartoon of the Week 5"